Family and Consumer Sciences instructors are encouraged to be active in their community and profession. 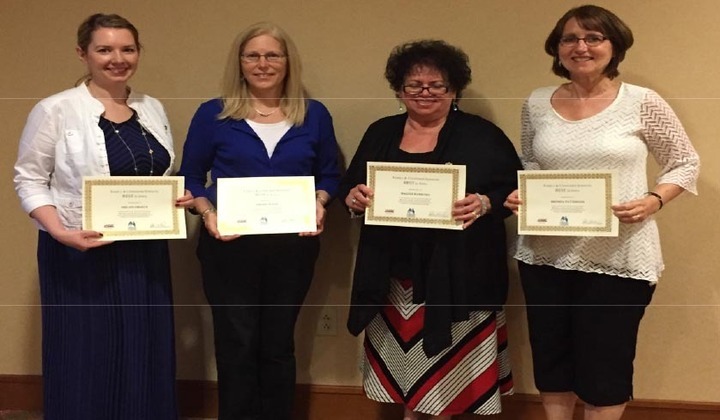 At the Iowa Family and Consumer Sciences Educators Conference on June 13th, Maxine Barrows (CFCS), Tammy Knox, Brenda Patterson and Megan Droste received the award called BEST in Iowa. BEST stands for Belong (Professional Membership, Professional Leadership, Professional Committees, Community/School Involvement), Excel (Mentoring, Honors/Awards, Presentations, Published Articles), Study (Graduate Credits, Workshops, Certifications), and Travel (School Visits, Business Internship, Business/Industry Visits, Conference Attendance).